So today I’m going to review the Worx turbine corded leaf blower which features 600 CFM/110 mph air output. The turbine 600 is definitely one of the fastest ways to clean up your yard hands down. The turbine jet technology has some of the most powerful blowing force I found in a non gas powered leaf blower. You get all the benefits of a professional blower without having to deal with gas, fuel mixture, and harmful emissions. 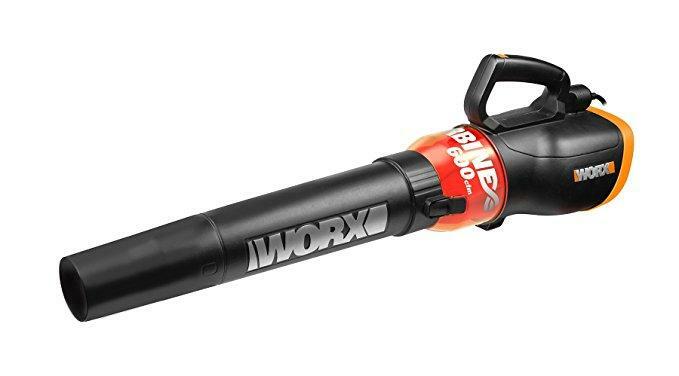 The Worx turbine blower extremely lightweight. I found it light enough for one-handed use so even older people and kids can have the pleasure of doing some leaf blowing. At 6 lb this is a leaf blower that just about anybody can use easily. This blower features a hyper stream air nozzle which boost airflow to help tackle even some of the heaviest debris including wet leaves and grass. I was able to blow debris from almost 15 feet away with the Worx turbine blower. Another great thing about this blower is that is extremely quiet. I wouldn’t hesitate to use in in the mornings or in the evenings as I doubt the neighbors will even hear it if their windows are shut. I know what you’re thinking. 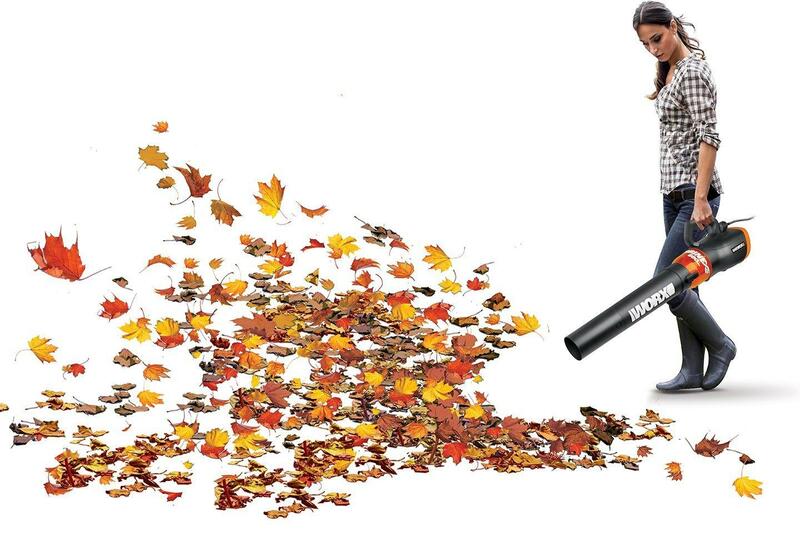 Do I really want a leaf blower that I have to plug in and drag a long cord around everywhere? Wouldn’t a battery powered leaf blower be much more convenient? 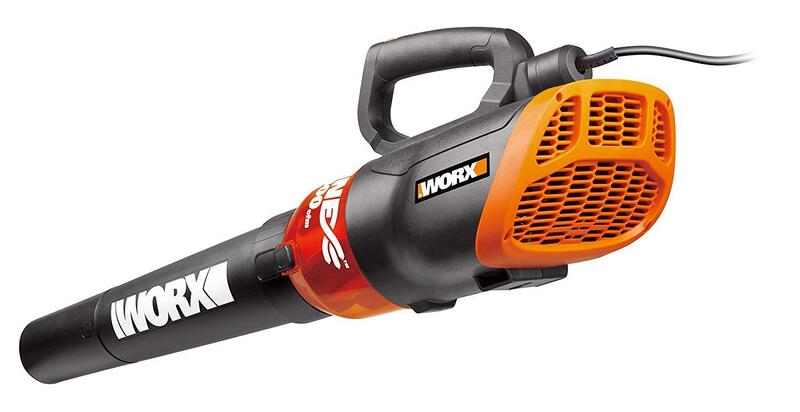 Yes a battery powered leaf blower is much more mobile than a corded version like this Worx. However, the batteries for those blowers can be extremely expensive and on average you only get between 15 to 30 minutes of continuous run time from a typical 40 V battery system. With a corded blower, there is no limit on how long you can use it. If you have a very large piece of property then a corded leaf blower probably isn’t the best option. But if you just need to do some blowing around your backyard, driveway, or patio that a corded blower will be perfect. Pro Tip: Don’t aim this blower directly at anyone’s face. You can almost blow someones eyeball’s out of the socket…which isn’t a good thing. Can I use this blower to dry a vehicle after washing it? Yes you definitely can. At 600 CFM you have as much blowing power as most gas leaf blowers. Will this blower blow grass out of my mulch without blowing the mulch around? No, this blower has so much power is going to blow the mulch out of your planter along with the grass clippings. Does this blower come with a long cord? No you will definitely need an extension cord. You can use multiple cords if you have a large area to blow. How many volts do I need to use this blower? Does this model come with a vacuum attachment and bag? This model does not have the ability to vacuum, only blow. Can I use this blower to blow the lint from my clothes dryer vent? While I haven’t tried this, the blower has plenty of power and should clean your vents just fine. Be sure to wear eye protection and a dust mask for safety.